Josmi and Joby are the parents of a 3 day old girl baby, who is fighting for her life in the Neonatal Intensive Care. Joby is a daily wage laborer who loads and unloads goods in the market, and Josmin is a sales women at a textile shop. They already have a difficult time making ends meet as they had to spend all their savings on a corrective surgery for their older son who was born with a cleft palette. When Josmin conceived again, she was diagnosed with gestational diabetes. The couples visited the nearby government hospital for delivery care. Apparently babies gain lot of weight if mother has diabetes. The baby weighed 4.6 kgs at birth which caused complications during her delivery. Doctors in the government hospital tried hard and saved the babies life. However baby needed more treatment in a center with more facilities. Baby was shifted to a nearby private hospital. Joby and Josmin could never afford this treatment. However, they wanted to give their baby the best opportunity to survive. 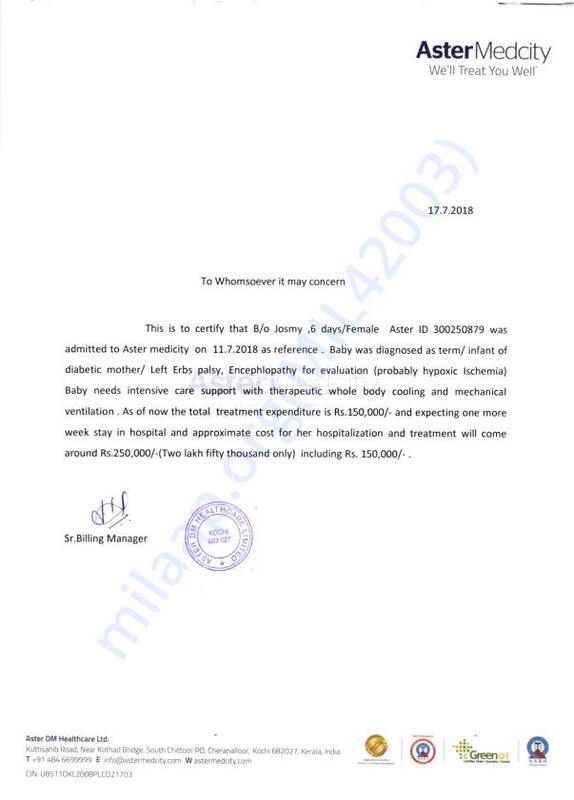 They did not think how they can afford the treatment but they got the child admitted to a neonatal intenisve care. Baby is on a ventiialtor. Babies one hand is paralysed due to difficult delivery. 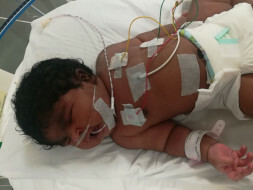 Baby also has complications of mother diabetes. Doctors have told he would need two to three more days of ventillation. They are hopeful of a reasonably good outcome. Joby 's mother is well known to me. She works as a house maid in our apartment complex. She is in a church the whole day praying for the baby 's recovery. I felt a strong urge to step out and help the family. 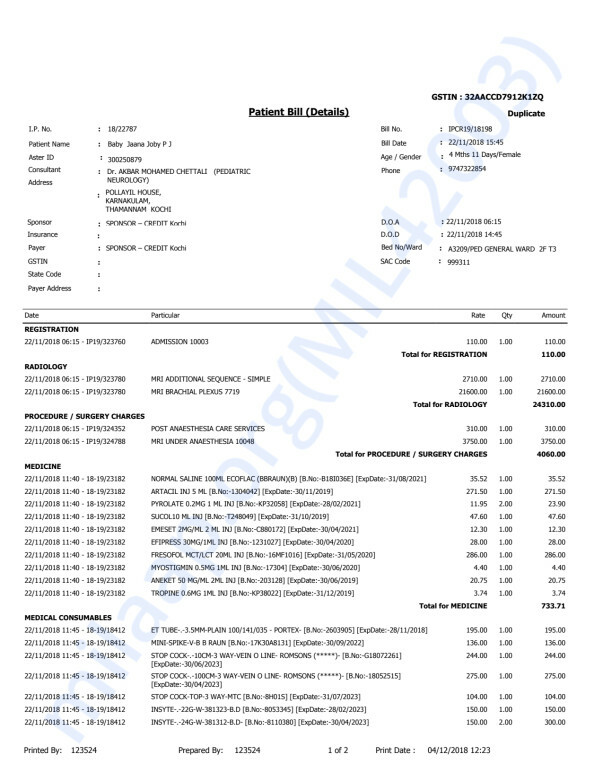 I have rasied some money from my personal contribution and from friends. 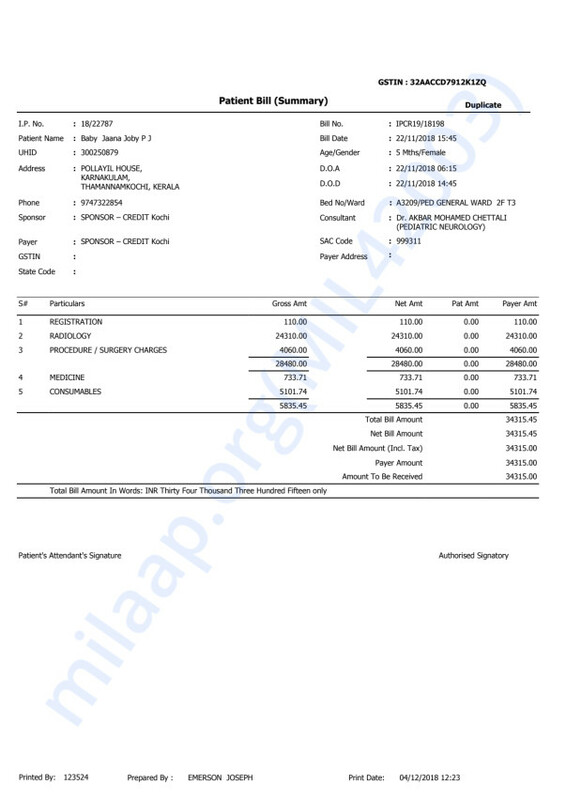 I realised that we would need some more support to help the family. Thnak you for your love and support. 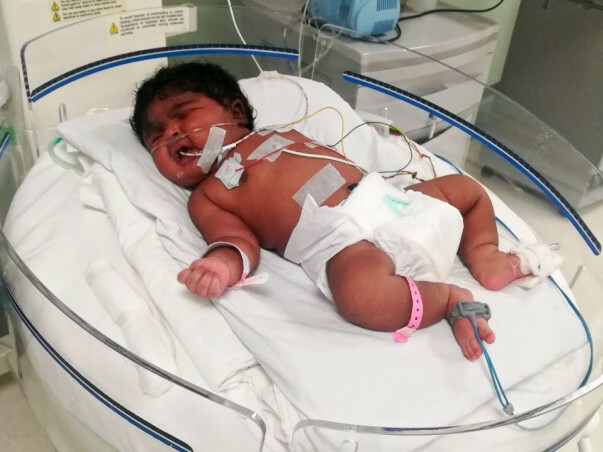 Baby of Josmie is doing better and is discharged but her left hand is completely immobilized .She has a nerve injury at the time of birth and doctor s wanted to do a MRI to find out the details of the injury . We shall keep you posted on the same. 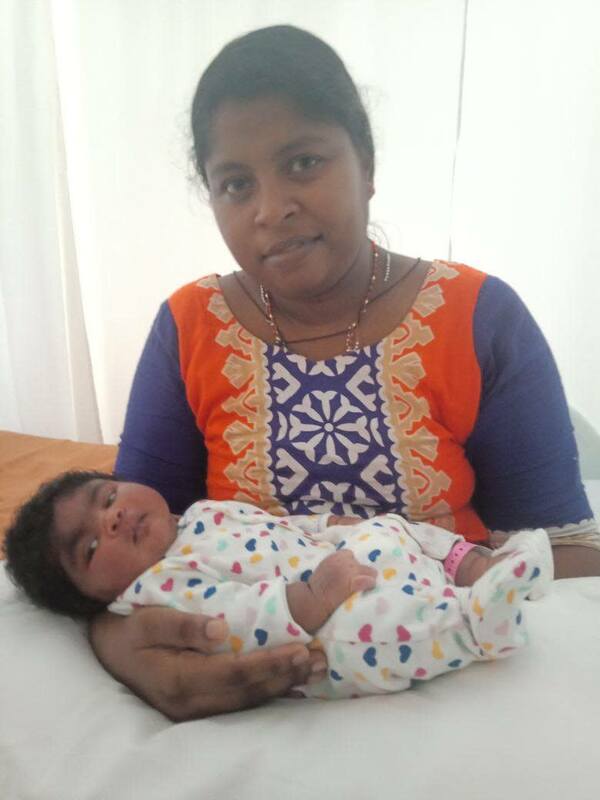 We are happy to inform you that Baby Josmi has made good recovery and is discharged home . Thanks for all the prayers and support. We could not have done this without you. Josmis baby is making good recovery with all your prayers. Baby is accepting feeds and handed over to mother for care. Doctors told us that baby did not suffer significant brain injury. Thanks to all your prayers. Doctors cooled the baby for first three days and that helped to protect the babys brain. Sadly Baby is not moving the left hand. His hands are paralysed due to injury to nerves. Doctors want to wait for some more time to look for any possible recovery. If no recovery is noted , Baby may need a surgery to try and correct the nerves. Hope God is kind on the baby and help recover the nerve injury. Baby is feeding well and may be discharged home in a few days. Once again , I Thank alll the contributors who stepped in to help a little baby in a far away land. Let God bless and baby and all of you for your kind heart. Insha Allah you will be fine soon...ameen!! !